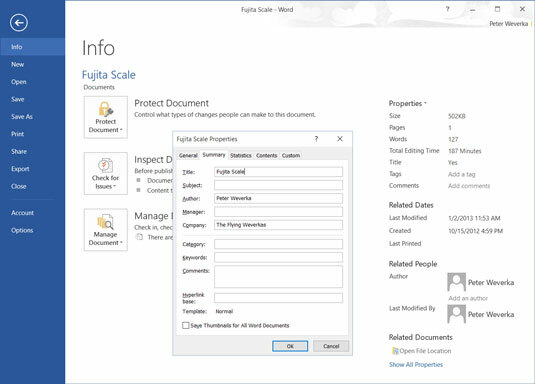 To read property descriptions in Office 2016, go to the File tab, choose Info, and examine the Info window. Property descriptions are found on the right side of the window, as shown here. View and enter properties in the Info window. Properties are a means of describing a file. If you manage two dozen or more files, you owe it to yourself to record properties. You can use them later to identify files. To record even more descriptions, click the Properties button (located at the top of the file descriptions) and choose Advanced Properties on the drop-down menu. The Properties dialog box appears. Enter information about your file on the Summary and Custom tabs. You can read a file’s properties without opening a file. In Windows Explorer, File Explorer, or the Open dialog box, right-click a file’s name and choose Properties. You see the Properties dialog box. Go to the Details tab to see descriptions you entered.